Too apt before to kill"
"Most patients love their GP but I hink we need to seperate that fantastic relationship between a patient and a doctor from where most practices now are on average four five six GPs working together under a single roof"
His comments are interesting and reflect his lack of qualifications for meddling in primary care. The personal relationship between a patient and 'their' doctor is the cornerstone of Primary Care. It cannot be replaced by the conveyor belt style of medicine favoured by superspecialised surgeons in centres of excellence. If Darzi had any credibility before then he has none now. But why did the BBC alter his quote? It was clear as day on the video feed. "We need to support that fantastic relationship between a patient and a doctor"
and then changed the inaccurate quote to a paraphrasing, followed by complete removal. The answer is simple, when it is organised by the BMA. 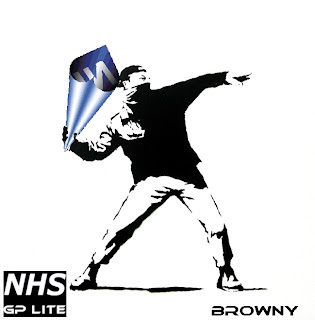 GP's have been balloted on Gordon Brown's bullying Government's offer on changes to the new GP contract. This offer (known as option A) has been followed by a threat (option B) if A is not accepted. A and B are both pay cuts and it is glaringly obvious that B is worse than A. A is not acceptable as it provides no new resources for opening longer hours, is the antithesis of family friendly working and specifically does not allow for adjustment of workload to protect patients against overworked and overtired doctors. B could easily destabilise Genral Practice, leading to dentistry style queues for treatment. It would save the Government huge amounts of cash which could be invested in private companies and their shareholders, or to prop up an ailing mismanaged bank. GP's have been asked to vote on whether they accept the 'offer' or the 'imposition'. How can one vote for an imposition. I wish for neither. I would prefer another choice. I am opposed to both options but wish the GPC to seek all recourse to Law and ballot for possible industrial action if the Government imposes Option B. So I do not have a vote, a simple yes or no to option A would suffice. The GPC are insisting that I am given a selection choice. The explanation is that whatever I SELECT the government cannot then try and spin my choice. They do not seem to realise that, as with al other recent proclamations on GP contracts, it will be spun and spun by Brown, Johnson, Bradshaw, and their puppets at the BBC. The only ones who will think GP's are getting a vote will be the media, the public and the government. Remind yourself why I pay my subscription. Because it won't be for long. So its official. A two horse race to own Northern Rock. Who will be the chosen one. The Bankers who got us into this fine mess in the first place. We are all reportedly subsidising Northern Rock to the tune of £2K per taxpayer. A total of £50 (fifty) billion. This makes the £40million they wouldn't pay to honour the police payrise seem like pocket money. The winner will have to pay back £Billions in the first 3 years. Who to trust. Well it is a no brainer to suggest 'The Management' take over. They are to blame in the first place. But what about Virgin. They will be saddled with a debt (to us the taxpayer) of 100 Manchester Uniteds, or 3 GP salaries (If we are to believe papers like the Daily Wail). With a track record on the railways of not delivering surpluses to the taxpayer and needing a £450million bale out last year, things do look good. But they are going to be ethical surely. I wouldn't like to cast a shadow on the dealings of Virgin companies. They wouldn't get involved in any shady practices like price fixing or cartels. Not like British Airways did with that other airline, you know, the one that grassed them up. What were they called??? Something Atlantic I think. Now Virgin wants to get into Health as well. Will they look after you if you are 'expensive to run', or a 'frequent patient'. You might get a Season ticket and be offered a credit card with each consultation. You might get to see a Doctor (after the Noctor). But will it be your Doctor? It might be your Lekarz. Better brush up on your Polish. But I know he's a moron, Gordon is a moron, Gordon is a moron, Gordon is a moron. I'm no Jilted John, but I might as well be. I was married to the NHS, thought I'd spend my working life with her. But no more. 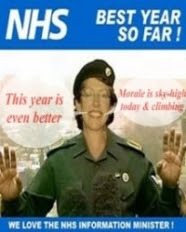 The incidious, creeping dismantling of the NHS is upon us. Oh no you say,but my GP is still there. Maybe but for how long? The door of the NHS is wedged open, not the front door so far, but the side door, the one no-one would use. The tradesmans entrance opened by the foot of big business. The land that employs the Noctor, not the Doctor. 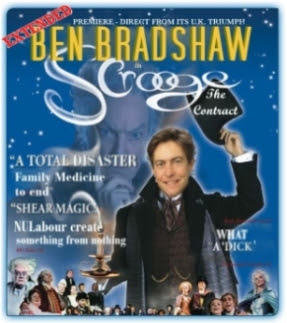 Why blame Gordon, he's new to the job, too busy checking his donations are above board to be fiddling with Primary care. We see 90% of the patients and consume 10% of the budgets. We'll be off his radar. But no. Gordon is a moron. Despite his protestations that 'top down pulling the lever soloutions are not always the ones that are going to work best' he decides to unilaterally change GP's working hours. General Practice is populated with many young professional men and women with young children. Many work flexible hours already to accomodate childcare arrangements. How will they manage to find a childminder from 6pm until 8pm. Yes but its only 3 hours per week. This year. 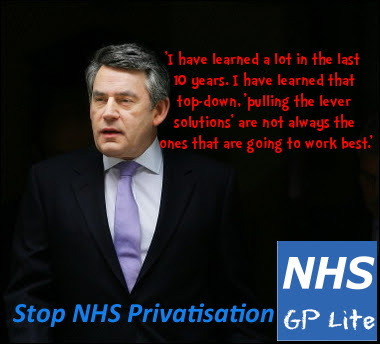 Year on year there will be more pressure exerted until GP's can cope no more with Gordon demands. Soon patients will be visiting their corporate healthcare premises, to see their many practitioners but will they see a GP. When is a contract not a Contract ? When it is called the GMS 2 Contract. Signed in 2004 to define GP's conditions of work and levels of remuneration. Signed in good faith by GP's and the Government. When it can be unilaterally altered by one party at 3 months notice resulting in a destabilising effect to General Practice in England. Yes for now, for although the original contract was agreed between GP representatives and all 4 national Governments in the UK current changes will only affect England. This is a change from the basis of understanding to contract changes which were believed to have been agreed across all 4 countries, with local extra services to be negotiated locally. The Government in England has stated that it's only priority for Primary Care in 2008/9 is to extend opening hours. It is not interested in improving quality of care which is a peculiar stance for a national government. It is actually removing incentives to improve quality of care so the net effect is to damage health care. They want GP practices to open longer, meaning longer working hours for reception staff, nurses and doctors. Do you want to be seen by a tired doctor at 8pm if they have been working since 8am? GP practices are not being given additional funding to extend opening hours. So this will mean reduced access during the day, no guarantee of 24 hour or 48 hour access. Later appointments - meant to help those at work will be open to all, so if you want a late appointment then it may have been filled by those whose access during the day has been reduced to maintain an acceptable workload to keep your GP and nurses fresh to deal with your problems. What evidence do they have to support these changes? An £11 millon survey showed on average that 84% of people were happy with access to Primary Care. In my practice that was 92%. 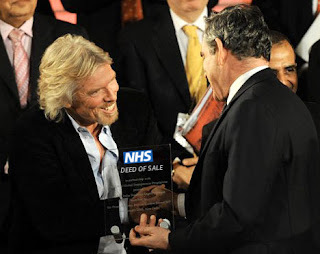 Gordon Brown will be remembered as the Labour Prime Minister who dismantled the NHS. Aneurin Bevan must be turning in his grave. Words are always evolving, coming in and out of fashion, like catchphrases do. Homer Simpsons D'Oh has even made a dictionary! Medical terminology changes constantly, usually with the advent of new illness, new drugs or tests, or sometimes by international consent. So when we had plain Xrays, we had not heard of Ultrasound Scans, similarly we developed CT followed by MRI and PET scanning capability. The last scan is not what you would have done at the vet's either. New drugs appear statins ,PPI ACE-I and ARB's and we change the names of old favorites to be in harmony with our international colleagues Frusemide to Furosemide. So it goes on constant change, progress, advances, new technology, groundbreaking, pioneering, breakthroughs, all for the good of the public of large. So What is a Noctor? NO postgraduate experience of taking responsibility for diagnosing, prescribing, management of illnesses, a minimum of 5 years postgrauate training to reach higher grades. Today you could, be visited at home, attend a hospital clinic or walk into a walk in centre dealing with minor illness and be treated and managed by someone who has about 13 weeks training. I'm still learning about my job, daily. I've been a Doctor for 14, an accredited GP for 8 and have dedicated myself to my profession for19 years. Do I think I could be doing that after 3 months of training? So I take my hat off to the Noctors. They are either exceptional talents or foolhardy dangerous practitioners, mistakes waiting to happen, the ticking time bomb of the NHS because of the lack of well grounded training. Welcome to my blog. I am a doctor working in the embers of what used to be the great NHS. I'm self employed and have invested in my Practice and patients. The NHS is changing, not because it needs to, not because it has to, but because someone wants it to in contradiction to all the evidence. The NHS is changing, nine reoranisations in nine years tells us that. There are now more managers than beds in hospitals. Hospitals we are led to believe are dirty, dangerous places to go to. Hell yes - they are full of sick people I hear you cry! This is true, but nasty superbugs also live there. Why? Perhaps cleaners don't clean, nurses don't nurse, doctors don't manage and managers don't doctor. Patients sometimes would rather die than go into hospital, and often their wish is granted. Please do not be fooled by the facade of 'Holby' as a real hospital, as 'Doctors' as real primary care, unless your local really is the Queen Vic or The Rovers, or your Vicar really is Dawn French. The real world is out there and just as the local shops are being replaced by tiny supermarkets, the next target is the newly privatised NHS. The NHS is at Custers last stand with General Practice being the circle of wagons surrounded by Apaches, the helicopter variety, supplied with Tommahawk cruise missiles, led by Chief Jaw Drop Brown and his Braves. Be afraid, be very afraid. They have formed a pact with the mercenaries of Big Business and scalps are there for the taking. Your Primary Healthcare, or GP Practice as it was known in common language is 'The Best' and 'The Finest', and the envy of the world, but before long it will be just 'Basics' and 'Value' as your taxpayers money will end up as profit for the fat cats. A question: Who does your GP answer to? You the patients of course. Another Question: Who does Big Business answer to? and maybe you the patient. And then what will we do? ?